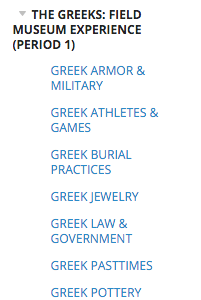 I researched deeply one artifact from the Field Museum and created a virtual “museum label” for that artifact on a webpage for our class website about The Greeks Exhibit. I will provide cultural (e.g. religious, political, daily life, etc.) background on the artifact, connect it to our studies of the Ancient Romans, and reflect on the impact the artifact has on our modern society. 1. With your partner, access the Schoology folder for the topic you were assigned. Read through the websites and materials and fill out the guided note-taking worksheet attached. You are working with your partner to research at least one artifact and build one webpage for that artifact together. At least one image of an artifact from The Greeks exhibit that relates to your topic (View the images provided in Schoology). Write a description of your artifact in your own words. A map of the region from which your artifact comes (View the images provided in Schoology). Background information on your artifact. This is a wide topic, but you want to put yourself in the shoes of the viewer. What do they need to know about this artifact for it to make sense to them? What should they know about the artifact that they can’t see with their eyes? Use your guided notes to create at least one paragraph providing a descriptive background for the artifact. In a separate paragraph, explain why this artifact should matter to the viewer. Why should the viewer care about this image? Why is this artifact meaningful? What does it teach us about the Ancient Greece and its values? State how this image relates to the Ancient Romans/Rome. Think back to our past units and discuss with your partner how this connected to the Romans. In your closing statement, reflect on how this artifact still has meaning today. You may have to use your abstract thinking here to connect the past to the present. Please also include your names as the authors on the webpage along with the links to your citations. Check with Magistra at anytime if you want to confirm something about your artifact. That is why I am here! To help you! Use the attached checklist to check your work before finalizing it for the due date. ﻿1. Search the Schoology album for at least 1 picture of an artifact related to your topic. 2. Take screenshots the pictures and maps from the album to your camera roll (Photos). --You will need to crop the image before you upload to Google Sites. 3. Write up the descriptions and explanations in Google Docs. 4. Don't forget to cite your resources using Easy Bib and post the citations on the website. Only 1 student (per group) should be editing the webpage at any given time. 1. Click on your class's website and open it in Safari. 2. On the bottom of the screen click "Sign in." You will then be prompted to sign in with your wps39 email account. 3. After you log in, you will then need to click your section of the website (on the left) that you and your partner were assigned to edit. 4. Once in your section of the website, you will need to go into edit mode. This is done by selecting the pencil icon on the top-right portion of your screen. 5. An edit menu will appear on the top part of your screen that lets you edit any text on your page. 1. Tap on the "Insert" tab on the menu, then select "Image." You will then need to tap "Upload Images"
B) Change size of the picture (small, medium, large, 100% width, or original size. C) Change the way the picture aligns with text (Text goes around the picture, text is only above or below the picture). D) Delete the picture from the website.